But before I write further, a quick flashback down history to put the whys, hows and some key dates on the commencement of the British Raj in context. The Island of Bombay used to earlier belong to the Portuguese who had their base at Vasai. Important Date 1: June 1661: Bombay is handed over to England as part of Portuguese princess Infanta Catherine of Braganza’s dowry on her marriage to Charles II, under the Anglo-Portuguese treaty. Important Date 2: 1668: King Charles transfers the island to the British East India Company for a loan of £50,000 at 6 percent interest and with a rental of £10 per annum. 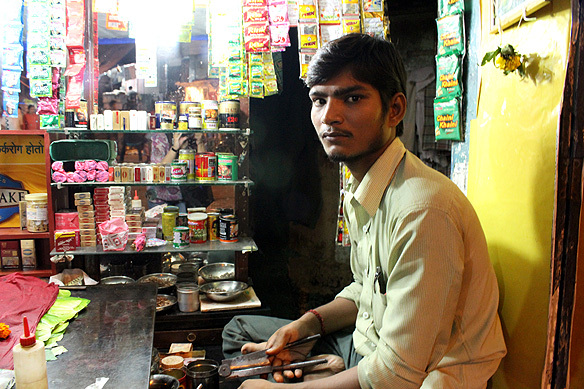 Important Date 3: 1757: Official Company rule of India, or Raj, begins. Three dates which changed India’s history. And now back to my walk. I start at the Apollo Bunder, the site of the Indo-Saracenic Gateway of India, much like all those who arrived through the years crossing the Arabian Sea. The Fort area contains some of the oldest parts of the city. For very many years, this was the city. The historically commercial and administrative quarter of Bombay was once upon a time enclosed in the defensive walls of Fort George or St. George Fort. Built by the British East India Company in 1769, around Bombay Castle—one of the city’s oldest defensive structures—it was named after King George III of England. 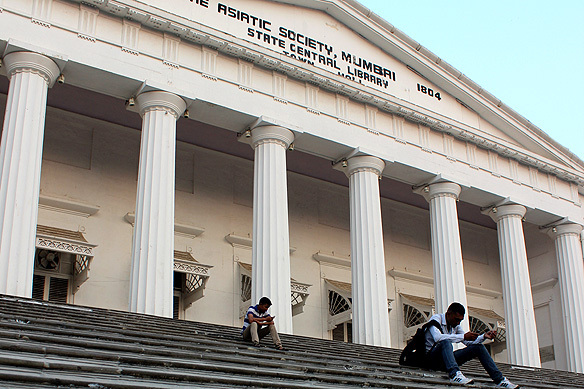 A mile long and a third of a mile wide, the Fort stretched from the docks in the east to Azad Maidan in the west, and from Victoria Terminus in the north to Kala Ghoda in the south. The walls were pulled down less than a century later (in 1862), but the name stayed and the social and economic arrangement established remained intact, framing the patterns of lives within, till date. 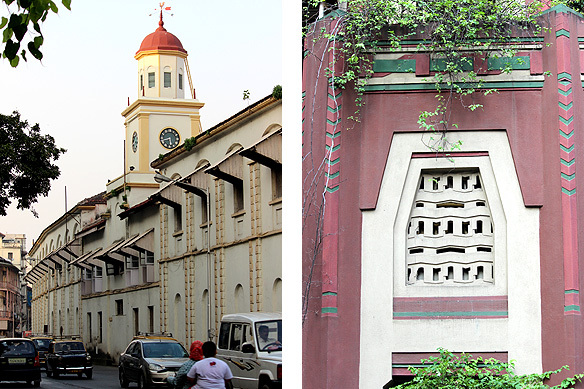 The southern part of the Fort marked with wide boulevards, towering trees, and neo-gothic and art deco architecture, once populated by the ruling Raj, is now the abode of wealthy Indians, and corporate and administrative offices. Entering through the Apollo Gate (long gone), I walk past the Dockyard on my right and Great Western Building and Scots Kirk, the latter fashioned after St. Martin-in-the-Fields in London, on my left. 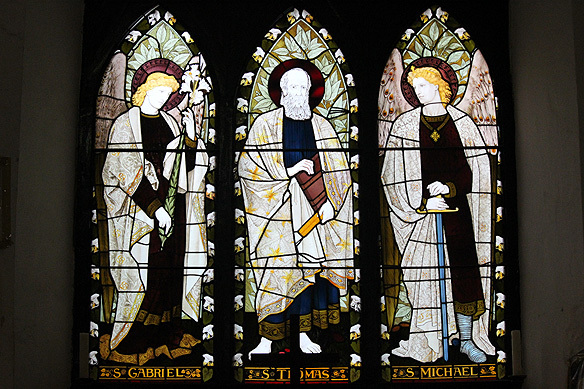 It is a world 200 years frozen in time. The north, in contrast is an eclectic maze of narrow lanes piled upon each other; The homes and shops of the indigenous locals in the past, and in present times, that of the less well off. 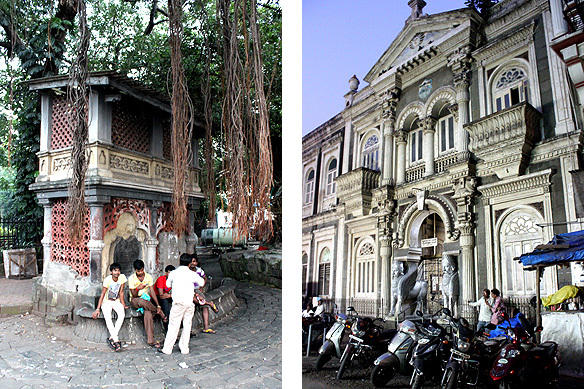 Mosques, a Parsi Agiary, Jain and Hindu temples huddle around narrow streets packed with wares. Wobbly wooden balconies hang on to centuries old buildings, while bright lights and music waft through the crowds. The chaos miraculously ends at the Fort’s Bazar Gate. 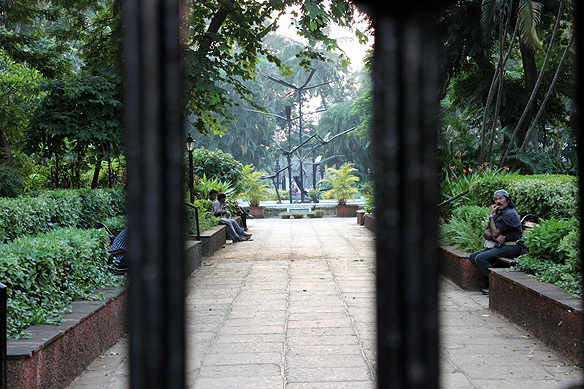 Somewhere in between, much like a transition and meeting point, lies an open expanse of green, the Horniman Circle Gardens (known as the Bombay Green in the 18th Century) and the Fort’s third gate, Churchgate. 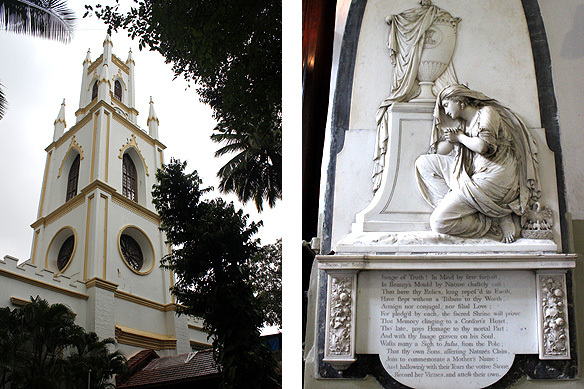 The gardens are surrounded with grand edifices impressing through religion, knowledge and finance—The St. Thomas Cathedral, The Asiatic Society of Bombay, and the Elphinstone Circle which houses leading Indian and International banks, respectively. 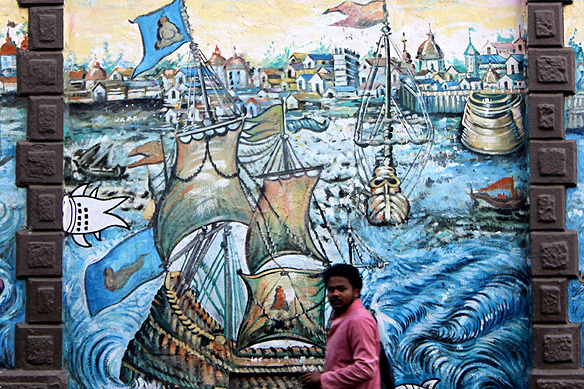 Over the last three centuries Bombay’s historical Fort has morphed into Mumbai’s financial Fort. However, its pockets of people and urban life juxtaposed to perfection, has stayed constant, giving the area an unequalled intensity and character. It is dark by now. 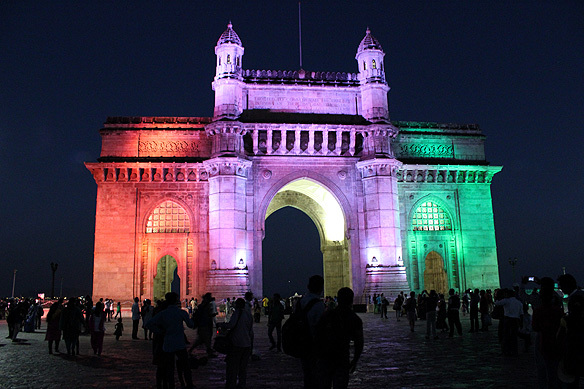 I want to linger on a little longer, so decide to go back to the Gateway of India, and am just in time to see it get bathed in the saffron, white and green of India’s flag colours. The extravaganza feels all the more significant as it was through the Gateway that the last rulers of the British Raj left, leaving the Fort they built and pulled down, and which whispers to those who wish to listen, behind. This entry was posted in Bombay aka Mumbai and tagged Apollo Bunder, Bazar Gate, Bombay Dockyards, Bombay Green, Breakfree Journeys, British East India Company, British Protestant Christians, British Raj, Churchgate, Elphinstone Circle, Fort, Fort George, Gateway of India, Horniman Circle Gardens, Mumbai, South Bombay, St Martin-in-the-Fields, St. George Fort, St. Thomas Cathedral, The Asiatic Society of Bombay by Rama Arya. Bookmark the permalink. Awesome ! So Happy 🙂 I enjoy your blog too. I used to live in Sri Lanka when I was a kid… Next time you in town, do let’s meet up.